Chad Baldwin’s family history helped guide him into the AV industry. His grandfather was someone who Chad looked up to immensely as a kid. He was a beacon of integrity and strength and had an impeccable standard for quality. As a journeyman electrician, “Poppy” helped wire and light up much of NYC in the 60’s, 70’s and 80’s. Chad proudly followed in his grandfather’s footsteps and became an electrical apprentice himself after high school, working hard to learn the trade. In 1998, Chad moved west in search of forests, fresh air and a nice place to raise his family. He quickly found work here in Portland as a licensed low voltage electrical technician. He fell in love with Portland, and decided to “plant his roots” here. 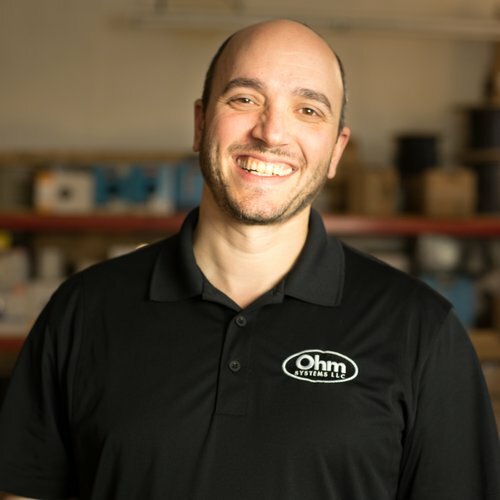 After working for several other security and Audio/ Video companies in Portland, Chad decided to start his own business in 2005, forming Ohm Systems, LLC. Chad often looked to his family for guidance when getting started. His father, Ed, is also a longtime small business owner and another remarkable role model in Chad’s life. Chad spent countless hours working side by side with Ed on well pump and water systems and was groomed to think outside the box and to appreciate and rely upon his own ingenuity. Ed’s father (Chad’s other grandfather) was yet another inspiration for the formation of Ohm Systems. After serving in the radio & signal corp for the US Army in WWII, he opened one of the first TV and electronic shops in Connecticut in the 1950’s. As a full service design, sales and installation firm, Ohm Systems reflects elements of each of these important influences. Ohm Systems allows Chad to focus on some of his favorite things in life, namely music and technology. Constantly learning and experimenting with different types of electronics, software and system configurations is a bit of an obsession. Music has also been a passion for most of his life. Chad started playing guitar at the age of 9 and continues to “dabble” to this day. He also likes to tinker with a modest home recording studio and the guy could spend an entire day sitting and listening to music selections on a decent sound system. Chad’s love for music has kept him interested in continuing a lifelong quest for great sound, and in different ways to help other people discover how much music can impact their lives.